If there is one category of food that I would say is taking up waaaay more space in everyone’s cupboards over the last ten or twenty years, it’s Oils and Vinegars. If we could peek into the kitchens of 1960, I think we would see one bottle of oil (corn,) and one of vinegar (white,) perhaps two if someone enjoyed malt vinegar on the fish & chips. Now? Our healthier/ tastier/ ever more exotic urges have brought us to the point where one would think we were opening our own small restaurant. While I love having this selection myself, what I don’t love is their effect on the surface beneath. 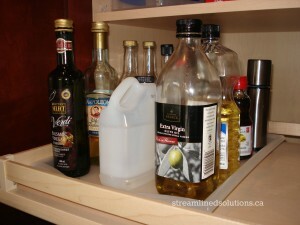 As a group, I think of them as the “Leaky and Stickies.” They need something to protect your cupboard. Option 1: An inexpensive plastic place mat, for easy cleaning. Option 2: If you are using a fixed (non-moveable) shelf, a turntable can keep them together and provide easy access. Option 3: In this pull-out shelf, I am using a plastic (Ikea) tray. If a container developed a more serious leak, it would be contained. Option 4: If you have a Leaky/Sticky that is kept in another area, give it a “coaster.” If it’s in constant view, a pretty coaster. If it’s tucked away in a cupboard, a plastic lid (from a yogurt or sour cream container) will do the job quite well. This entry was posted in Kitchen, Tips and tagged clutter, containers, cooking, kitchen, organize, plastic, tips. Bookmark the permalink.